At the farmhouse in Northampton, Splinter puts out a saucer of milk for the cat and feeds the birds, enjoying the serenity of nature before going back inside. At the Kurtzburg Memorial Hospital in New York, Dr. Klynor and Professor Honeycutt greet Casey and tell him that April’s procedure is about to begin. Dr. M’Beka has injected April with the Nanoturtlebots while over on the Utrom moon island, Glurin has put the Turtles in stasis inside mentawave cabinets of Honeycutt’s design. The Turtles will telepathically relay their fighting skill to the Nanoturtlebots, thus allowing them to destroy the Nanobaxterbots infecting April’s system. The millions of Nanoturtlebots are introduced into April’s bloodstream and immediately begin destroying the Nanobaxterbots one at a time. The fury of their battle causes some collateral damage to April and she begins to bleed. Dr. M’Beka and the other surgeons on site fight to keep her body together so she can survive the procedure. At the moon island, Shadow keeps watch over the Turtles. Karai enters the room and remarks that it is a tempting sight, seeing her old enemies completely helpless. However, she concedes that they are no longer enemies and that killing helpless pretty would not be sporting. Karai then compliments Shadow on her fighting skill, which she observed from video of the altercation with the Foot Clan at the moon island’s security checkpoint. Shadow is flattered but suspicious. Karai offers her the opportunity to continue her training with the Foot and maybe even consider membership, but Shadow tells her that now is not a good time to give the offer much thought. At the offices of the New York Journal, writer Daniel Carrolson returns from vacation and starts sorting through his mail. He finds a disc from some group called the “Xihad” and puts it into his Mac (making sure to note that PCs are useless against viruses and Apple products are the superior hardware). The video on the disc is from an angry masked man representing the “Xenoform Jihad” (or “Xihad”), a ruthless terrorist organization determined to evict the aliens (or “xenos”) from Earth. The masked man says that in one week, they will strike. Suddenly, there’s an explosion from the direction of New York Harbor. The explosion severs the mentawave link between the Turtles and the Nanoturtlebots, leaving April helpless. Back at the farmhouse, Splinter sits down to a cup of tea, unaware that the spectral form of the Rat King is watching him from the shadows. Suddenly, he grips his chest in pain and begins to stagger around. He makes it as far as the door and calls for his sons before collapsing to the floor, dead. Outside, the cat has killed a bird that was eating from the birdfeeder. At a pier across from the moon island, firefighters rush to clear out an Utrom warehouse that was the terrorist target. They find what appear to be dead aliens inside. An Utrom rushes over to the pier in his exosuit to find where the explosion damaged the mentawave cable link. After searching underwater, he finds the cable completely cut and beyond the means of a timely repair. Rejoining with another Utrom, he laments that it’ll take another stroke of Glurin’s genius to save April. Back at Kurtzburg, Dr. M’Beka monitors April’s rapidly declining condition, but is helpless to do anything. 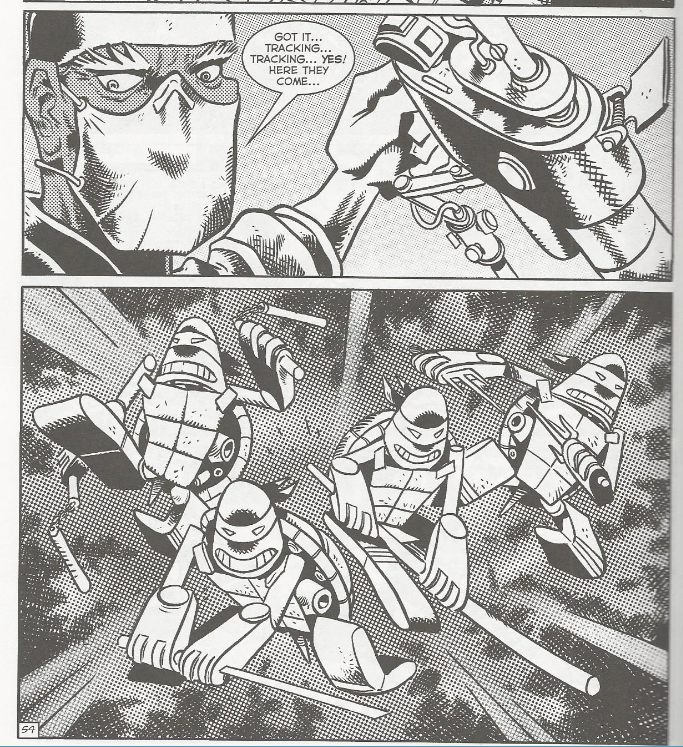 Glurin reveals that while the Turtles were hooked up to the mentawave system, he’d been running a background program to collect their “ninja data”. He didn’t want to mention it because Dr. Klynor wouldn’t have approved. With no alternative, Dr. M’Beka permits Glurin to upload the recorded ninja data into the Nanoturtlebots so that they can run again. It works and the Nanoturtlebots rally against the Nanobaxterbots. However, their success activates a dormant trump card Baxter Stockman had left behind just in case. A Megananobot, fifty-times larger than the other nanobots, activates and makes a B-line for April’s brainstem. Only a few hundred Nanoturtlebots remain and they all attack en masse. In the end, they triumph, though only four Nanoturtlebots survive. Glurin and M’Beka extract the four robotic heroes and celebrate their victory. April recovers a few hours later, bald but back to perfect health. Casey, Shadow, Robyn, the Turtles and the Fugitoid have all gathered to greet her and wish her well. Suddenly, a nurse comes in with a phone call for Leonardo; it’s Stainless Steve Steel, calling from his farmhouse in Northampton. Leo tells him the good news and asks if he could put Splinter on the line. Steve informs Leo that Master Splinter has died. *This story is continued from TMNT (Vol. 4) #9. The story continues in TMNT (Vol. 4) #11. *The mentawave cabinets are based on the mentawave helmet technology which Professor Honeycutt invented in Fugitoid (microseries) #1. *Shadow fought the Foot Soldiers on the moon island in TMNT (Vol. 4) #6 (the editor’s note in the comic mistakenly identifies the fight as TMNT #5). 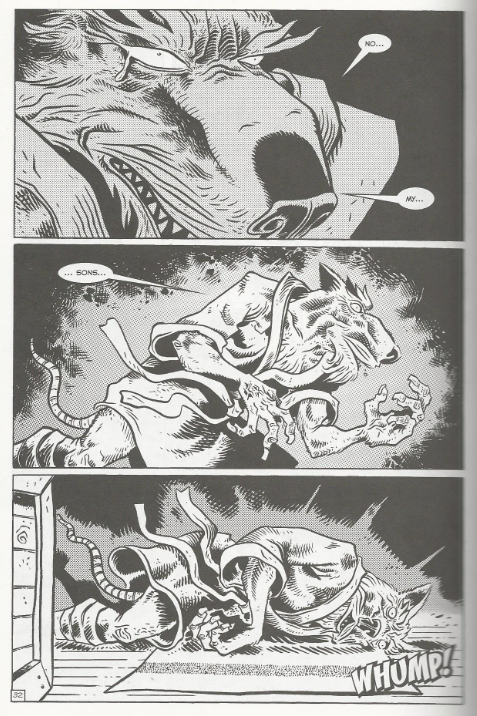 *Splinter’s death was foreseen (and the Rat King was bound to him spiritually) in Tales of the TMNT (Vol. 2) #35. *The Rat King previously appeared to Splinter as a foreboding specter in TMNT (Vol. 1) #55 and Tales of the TMNT (Vol. 2) #65. *The Nanoturtlebots will return in Tales of the TMNT (Vol. 2) #68. *Laird explains this was originally going to be two separate issues (TMNT #10 and TMNT #11). However, to celebrate the “milestone” of a tenth issue, he made it double-length by combining the two. 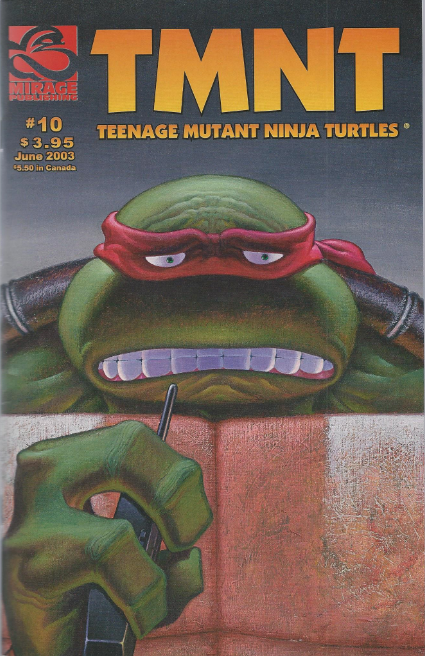 *This issue also featured a back-cover painting by Michael Dooney, later used as the cover for Tales of the TMNT (Vol. 2) #1. I’ll start with the death of Master Splinter. I thought it was absolutely perfect. There’s a small aura of mystery around it, what with the specter of the Rat King lurking in the shadows of one panel, but for the most part it’s an entirely mundane death. He has a heart attack while making tea and expires from natural causes. I know some people might find that anticlimactic, but let’s be real. Not every hero who lives to a ripe old age is going to die a heroic death, be it locked in mortal combat with an arch foe or sacrificing themselves for the greater good. Some heroes just grow old and die in their home while making tea. I thought it was the death Splinter deserved, too. There’s an extended sequence at the start of the issue where Splinter is going about his daily routine in a calm and serene manner, enjoying the animals he’s caring for and just relaxing in his retirement. It was as peaceful a death as most of us can hope for. But it was also sad to watch; this once mighty warrior staggering around helplessly, page after page, before weakly calling out for his sons and then collapsing, dead. 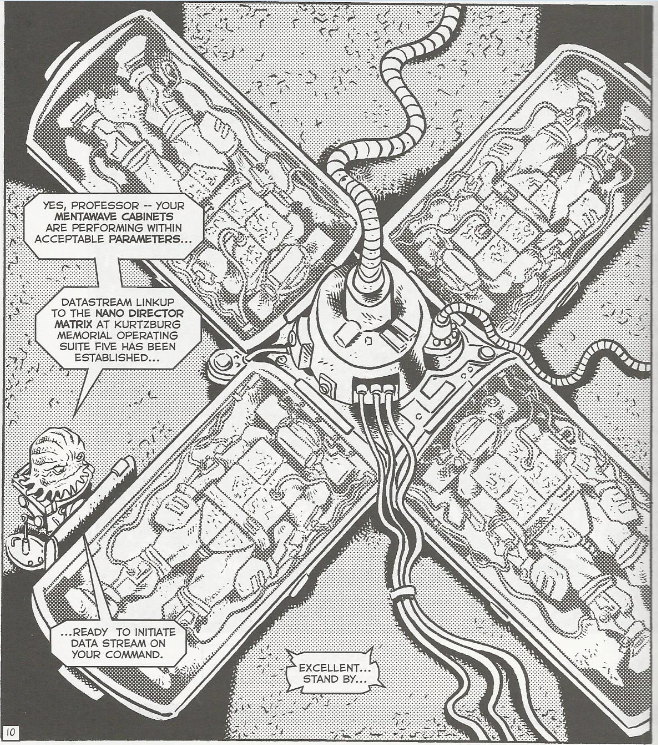 I’ve chided the book for its decompression, dragging things out when more economical storytelling would have sufficed, but the 6-page sequence of Splinter dying was decompression done well. He may not have gone out in a blaze of glory, but his death deserved more than a flippant 1-page sequence, too. Lawson and Laird handled it expertly and it’s my Number 1 most memorable moment from all of Volume 4. There are elements to think about and discuss within the sequence. The presence of the Rat King led to lots of fans suggesting he was somehow behind Splinter’s demise. Steve Murphy would write an issue of Tales of the TMNT Volume 2 many years later to explain his appearance in this scene (that Splinter would become the next Rat King upon his death), though I think I preferred the thrill of the mystery over the banality of the answer. There’s also some sort of vague message in there, perhaps intimating some symbolic tragedy. The last thing Splinter sees as he collapses, looking out the front door, is the cat he just fed eating the bird he lured to the feeder when he refilled it. Was this supposed to mean something? That by generously refilling the birdfeeder, all Splinter did was lure an innocent creature to its death? And a death at the hands/paws of another creature whom he was helping/feeding: The pet cat? Does this symbolism have anything to do with the Turtles or the narrative of TMNT Volume 4? Jeez, trying to wrap my head around all of Lawson’s ponderous symbolism is giving me flashbacks to TMNT (Vol. 2) #1. But a greater theme in this issue is that although one friend has died, another has been given a new lease of life. The first of April’s many Volume 4 ordeals is overcome in this issue, as the Nanoturtlebots save her from the Nanobaxterbots. Now, these fight sequences are pretty decompressed and they all just boil down to dull panels of little robots smashing other little robots. There isn’t a very good flow to the layouts and you won’t get much extra out of the pages by slowing down to inspect them panel-for-panel. You just sort of breeze right through the fight scenes and wonder where the issue went. That said, the suspense in the story doesn’t come from the fight but from the sudden interference by the Xihad (more on them in a minute). The callback to Honeycutt’s mentawave technology was a nice touch and we actually do get a better feel for Glurin in this issue, as he secretly collects data on the Turtles but doesn’t want to tell anybody because it was unsanctioned. He’s a good guy, but a bit of a mad scientist in that he prefers to break ethical barriers in the name of progress. Hell, even Kurtzburg Memorial Hospital finally pays off. Sort of. April had been cared for at the moon island in every issue since she got sick, but now they’ve suddenly moved her across town to Kurtzburg, if only to facilitate the suspense of the broken mentawave hookup. I guess a throwaway excuse might be that the moon island didn’t have the necessary medical equipment to complete the procedure, but it was still just an excuse to create a dramatic plot device. There’s also the exchange between Shadow and Karai; Karai trying to lure her to the darkside. It was hammy and the dialogue overwritten (a product of Laird’s Stan Lee-style dialogue captioning) and it never really goes anywhere, either. There’s sort of a callback to it in Tales of the TMNT (Vol. 2) #69, but we really don’t get much out of the idea. Karai is going to spend the next 22 issues of Volume 4 slinking around and acting “strange” and “suspicious” but never doing anything more than alluding to something questionable behind the curtain. It is going to get really old, really fast, and after 12 years of waiting we STILL aren’t any closer to finding out what her deal is. And now we’re at the Xihad. Yeah. 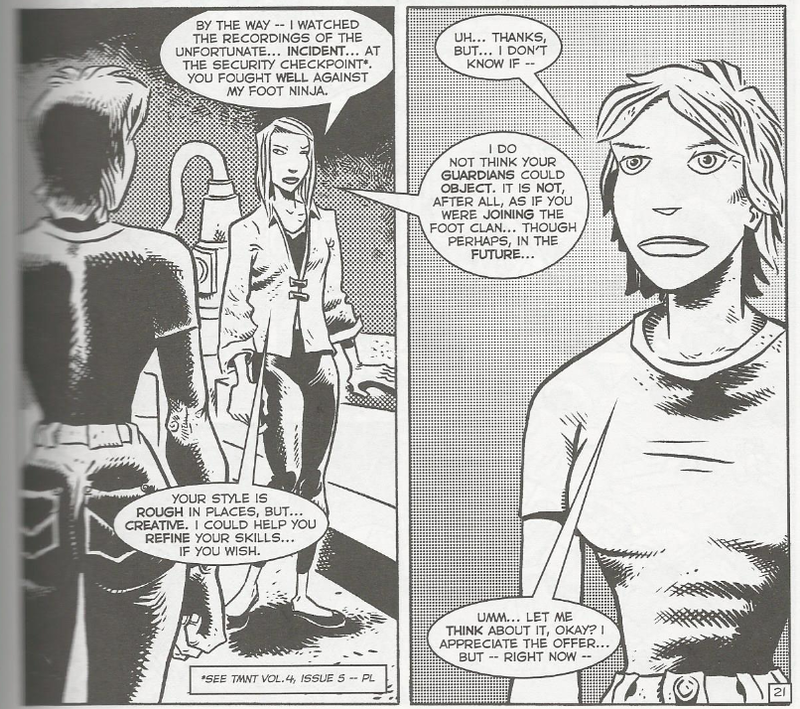 They’re an artifact of the time; this comic having been written so shortly after 9/11 with all the terrorist fears still circling the media (though they’re definitely making a comeback here in 2015). I will say that the Xihad are, in terms of the narrative of the volume, an organic growth of the Madhattan Maulitia and all their anti-alien fears that have been percolating since the first issue. It’s just that the name is stupid. Why would a nationalistic, patriotic, jingoistic movement name themselves after a word intimating the foreign terrorist group directly OPPOSED to American values, who had only recently taken 3,000+ lives (the events of 9/11 were referenced in previous issues of Volume 4)? 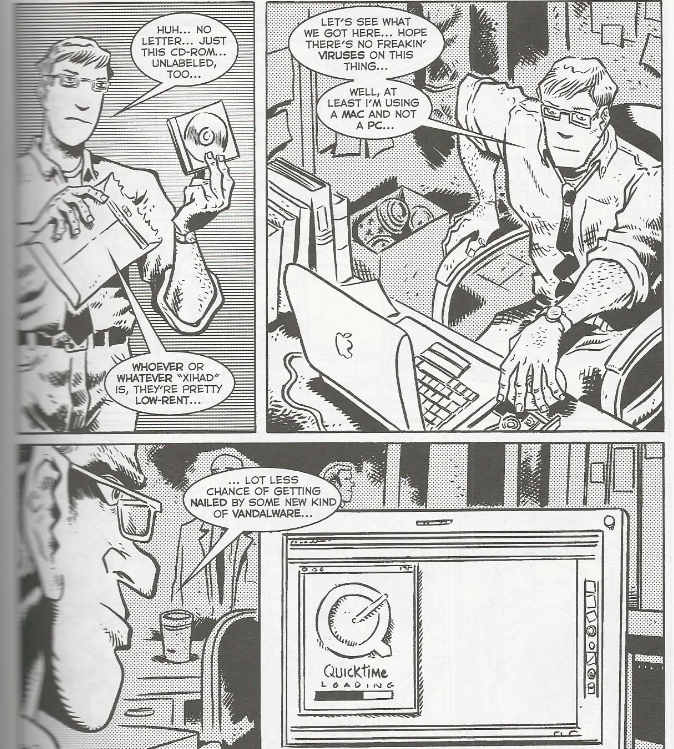 And on the subject of Laird awkwardly injecting his personal opinions into the story, there’s another page where a character stops everything they’re doing to tell the audience that Macs are better than PCs. Man, I swear, Apple fantatics are almost as sanctimoniously obnoxious as vegans. Almost. Anyhow, those little irritants aside, this is probably the best issue of Volume 4 and a good issue in and of itself. The next issue will mark sort of a narrative stopping point and represent what I guess is the “beginning of the end” of reasonably-lengthed story arcs in this book. But we can talk about that next time. Are you sure Laird wasn't getting paid by Apple? lol, I had completely forgotten about that shameless Apple plug. All kidding aside, looking back all these years later, this really was a fine issue and more than adequate way to wrap up the first half of Volume 4's narrative.